Keep it simple! Yeah, right. Well, these quick, cheap activities may help and have been a big hit this week for my 22 month old little man. 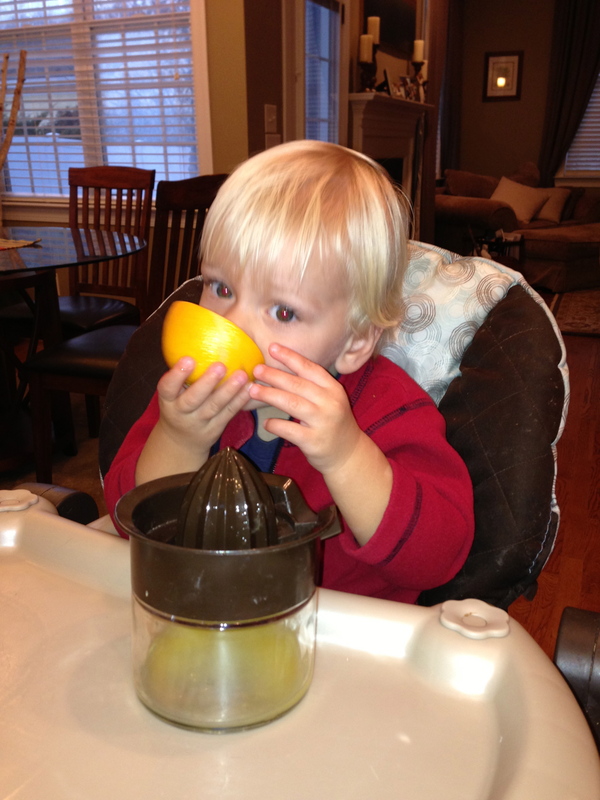 My mom gave us her old orange juicer – the simple, glass jar kind. B loved twisting the orange halves and making juice. He liked sampling the oranges too for a little QC (quality control). This activity helps with learning a practical life skill (making juice) and fine motor skill (twisting). I guess a little science too, maybe? Where does juice come from? Anywho. B also loves to sprinkle. I guess he sees me sprinkling seasonings into pots for dinner. He’ll come running over to where I’m cooking and ask to shake in the seasonings. This led to some interesting meals. So I started collecting a variety of shakers for his own use and enjoyment. 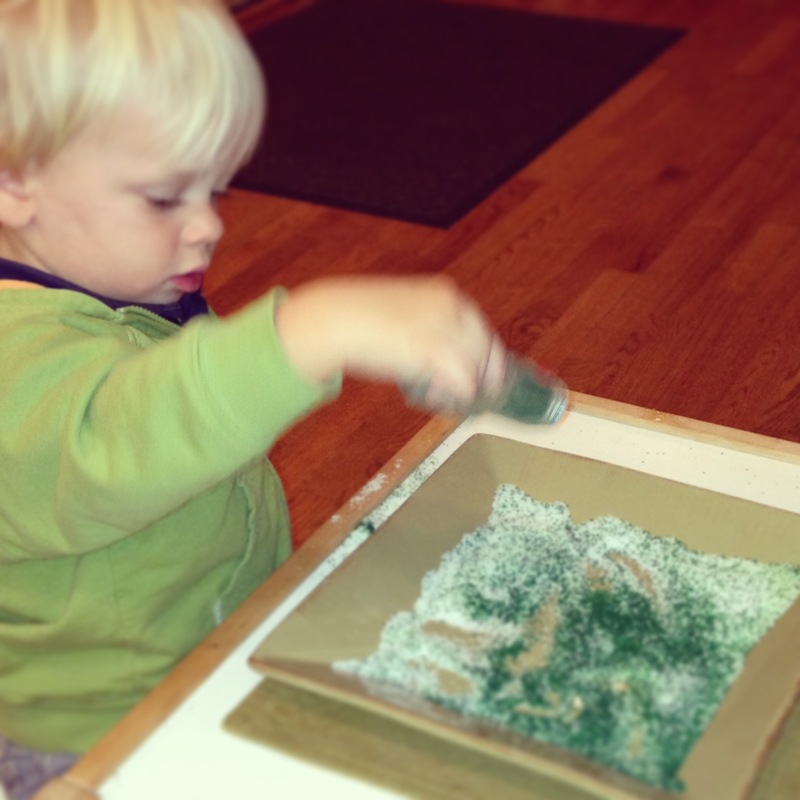 I know sandpaper letters and salt trays are an important component of Montessori work – early writing and reading. 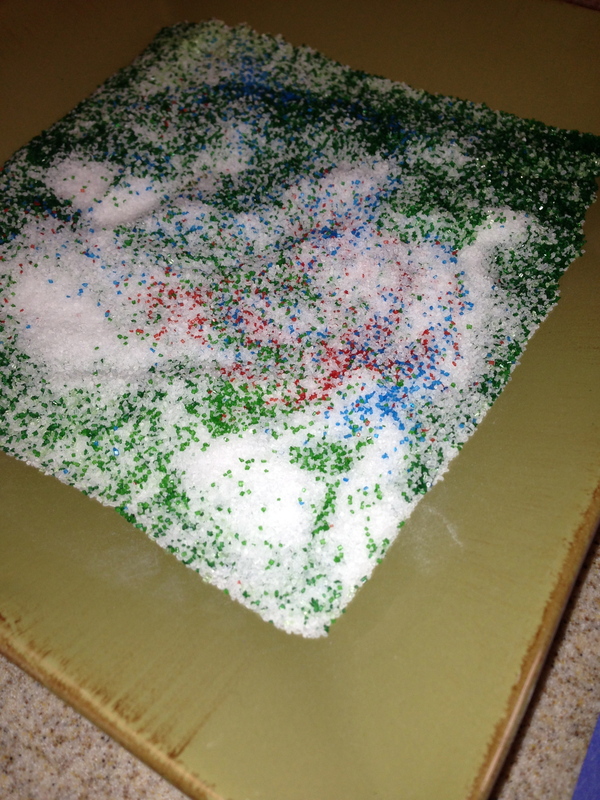 Here I combined sprinkling and the salt tray idea into one activity creating a salt/colored sprinkle dish. I first added a thin layer of salt to the bottom on the plate. At first, B felt the salt and moved his fingers around. Then I added some colored sprinkles and let him shake the sprinkles onto the salt. B loved shaking out the sprinkles and swirling them in the dish. He wanted to try all the colors we had. The dark green and red showed up nicely on white salt. I think this activity might cover multiple Montessori categories – art (colors), practice life skills (shaking), and sensorial (feeling the salt and sprinkle crystals)! I didn’t have any issues with B trying to eat the salt or sprinkles but he did want to dump some on the floor. As with almost all our activities, I did this one with him. At least I sat next to him and watched while he played (worked). I try to give words to the activities he is doing but not direct his play. NOT an easy task! The last activity is a quick, homemade salt letter that I made on a piece of construction paper. You can purchase Montessori sandpaper letters at Amazon. Yes, the salt sort of came off as B traced the “b” with his finger but it worked for the most part. 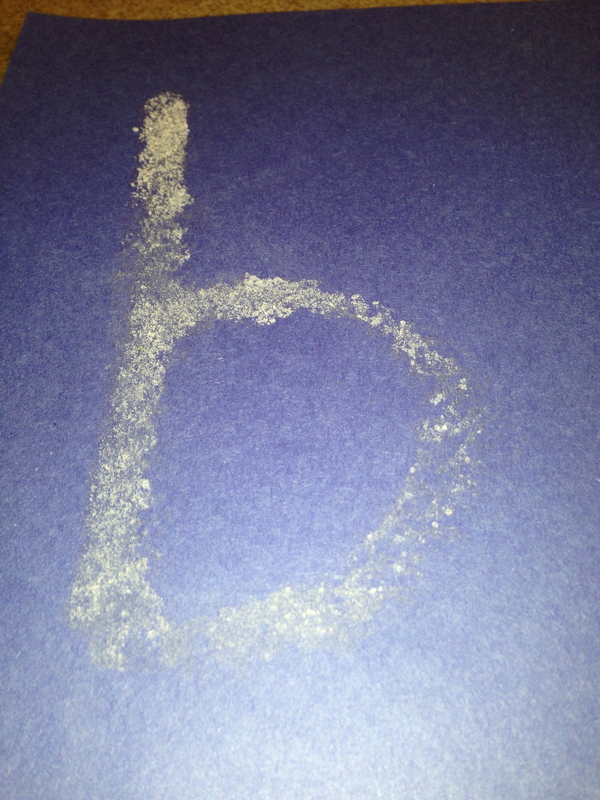 I used a glue stick to draw the letter and then sprinkled salt over top. 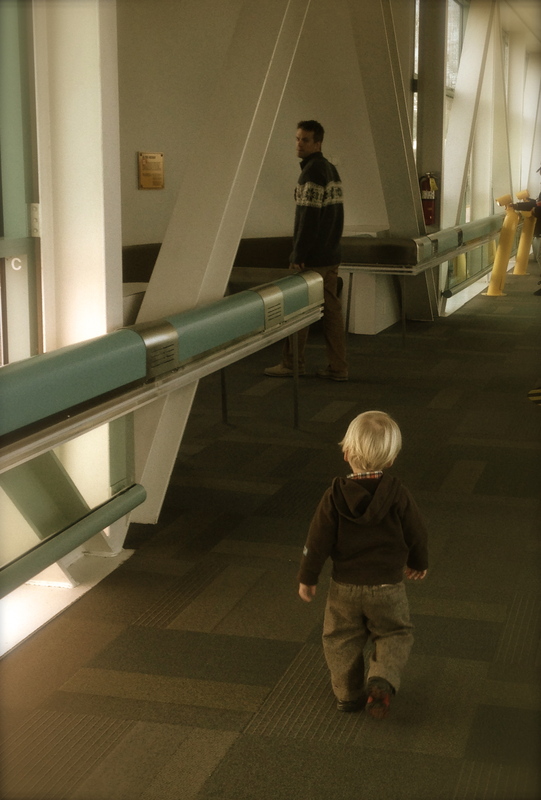 We had this long toddler-sized discussion about whether it was a “p” or “b”. B won and declared it was a “p”. I can’t tell if that was stubbornness or genius on his part. Hmmm. 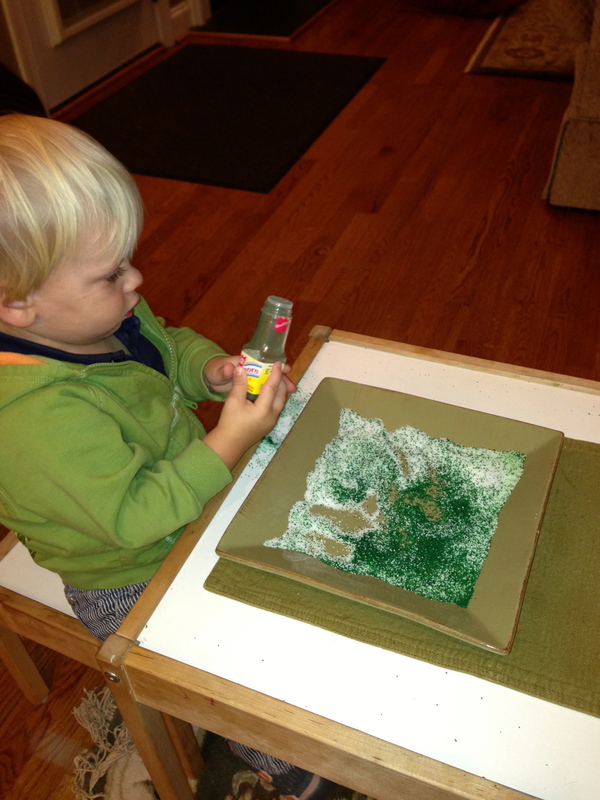 Here is an example of Montessori sandpaper letters you can buy from Kid Advance Co. 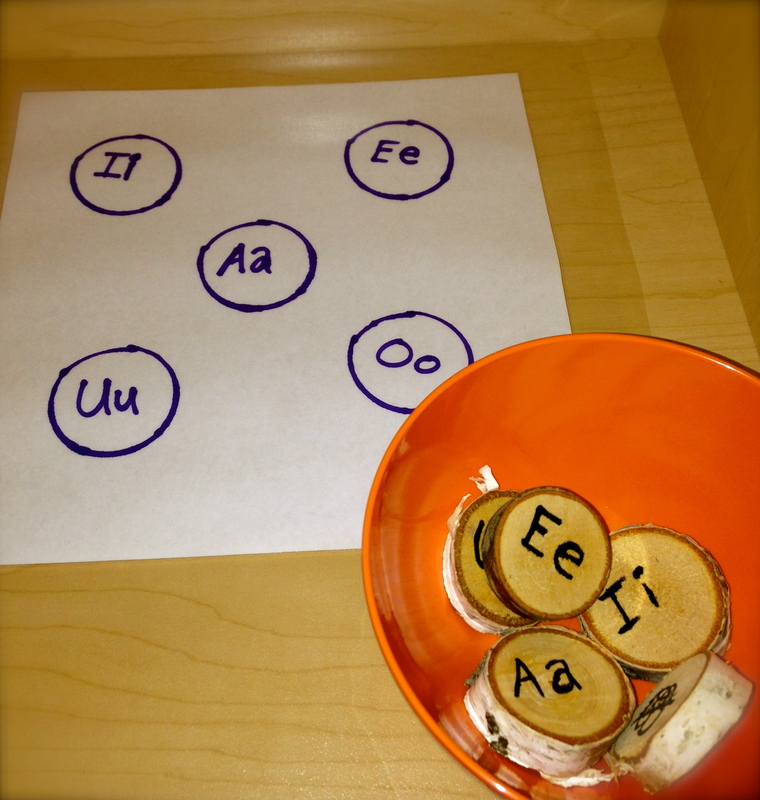 Here are some more sandpaper letter ideas and explanation from Living Montessori Now. 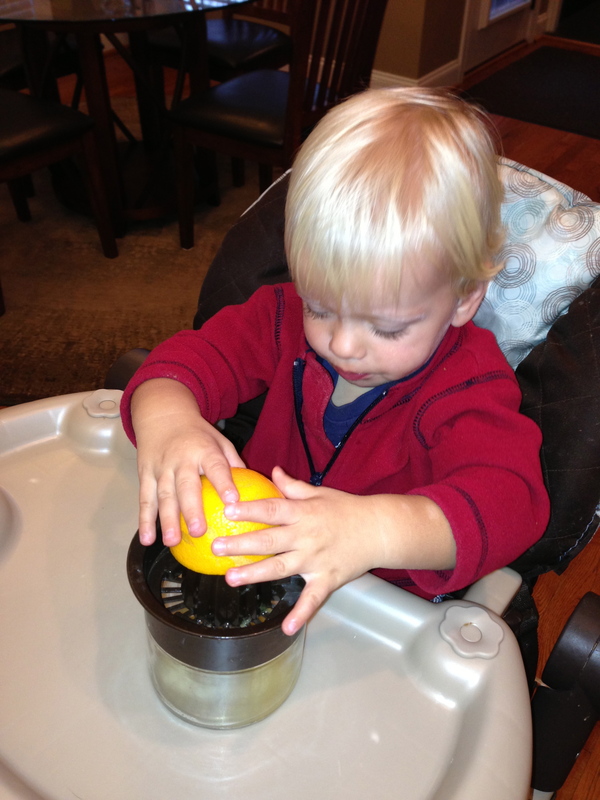 Categories: Toddler | Tags: 22 months, activities, color, juice, oranges, salt, sprinkles, Toddler, tray | Permalink. 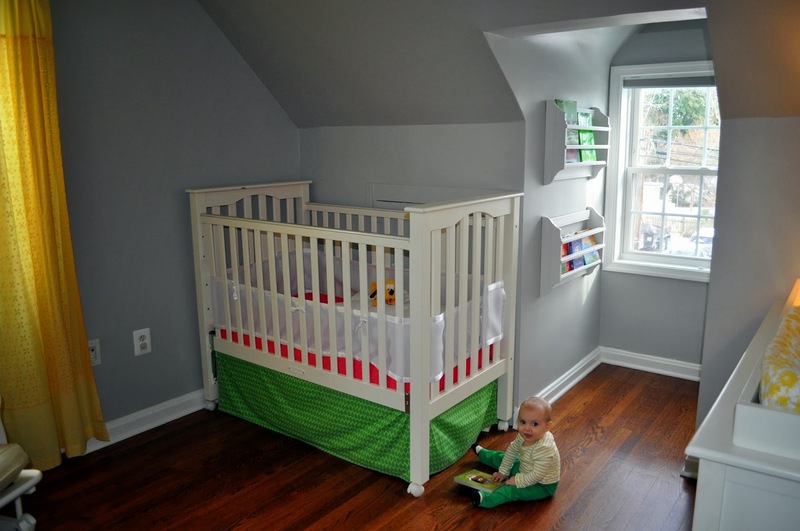 Check out this mom’s remodeling work for her kids’ room and nursery. I love the colors and the hardwood flooring! Beautiful! 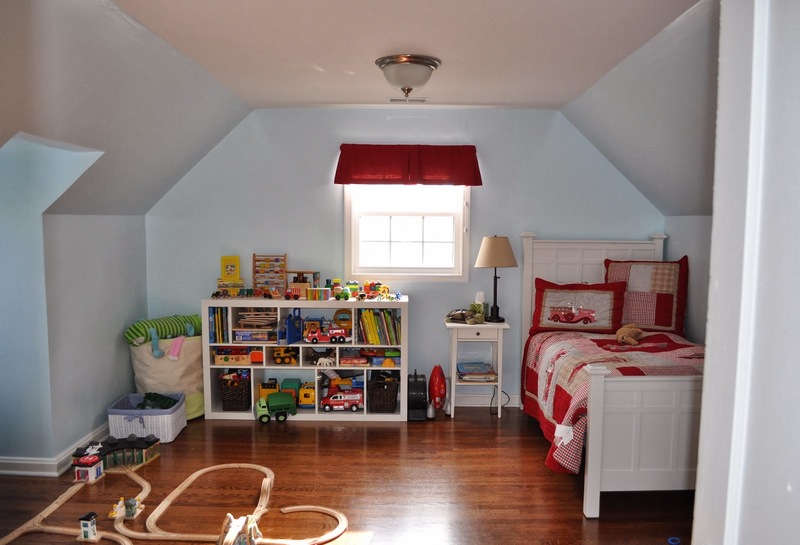 Have you remodeled or redecorated your kids’ rooms? What about the nursery? Categories: Baby Stuff | Tags: Baby, color, decorate, ideas, kids, nursery, paint, remodel, rooms | Permalink. 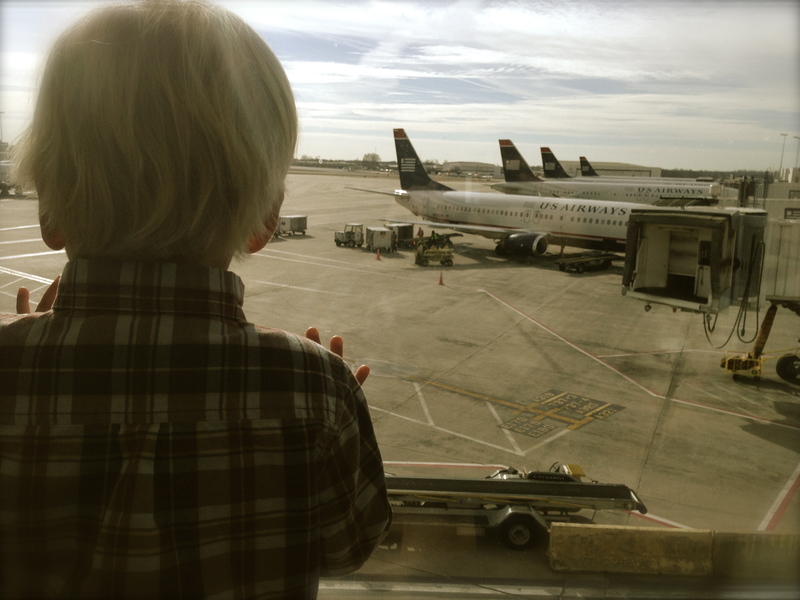 We enjoyed our visit with family in St. Louis, Missouri. 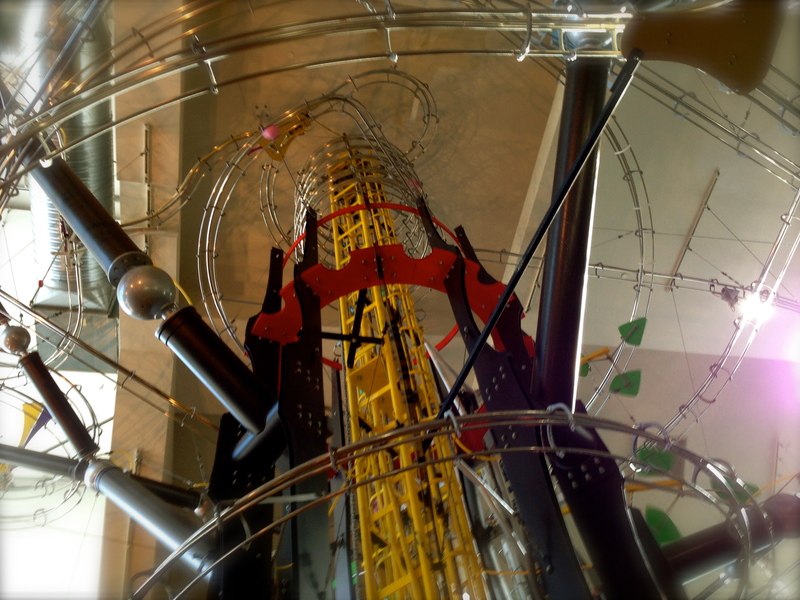 We visited the St. Louis Science Center. 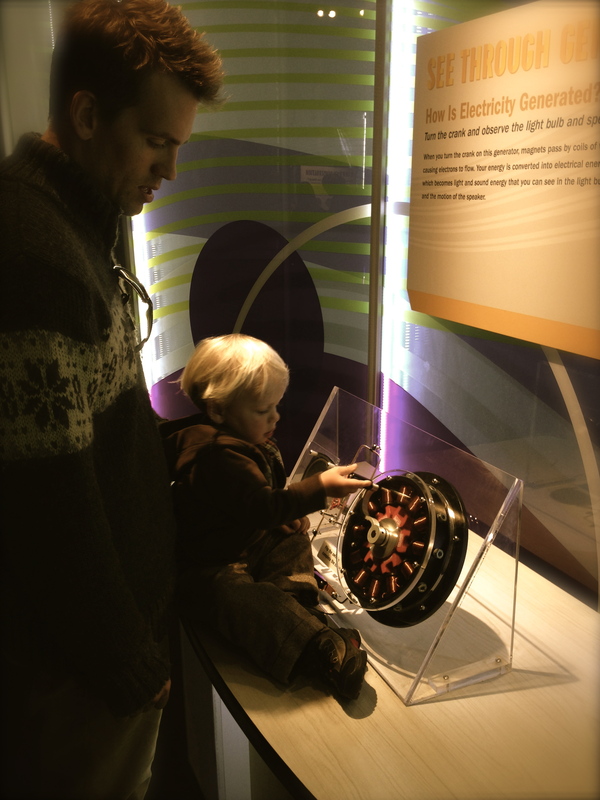 Even though B is only 22 months, there were lots of things for him to see and do. It basically was a great place to run and play on a cold, winter day. But watch out for those dinosaurs! They were scary. Sometimes it’s nice to be needed. 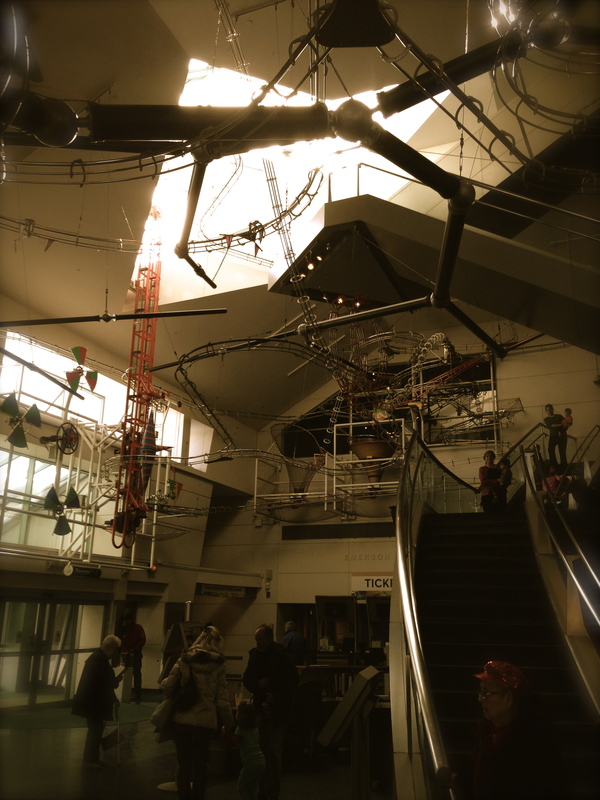 As we were walking (running) around the Science Center, I started wondering if we were encouraging science over the arts. 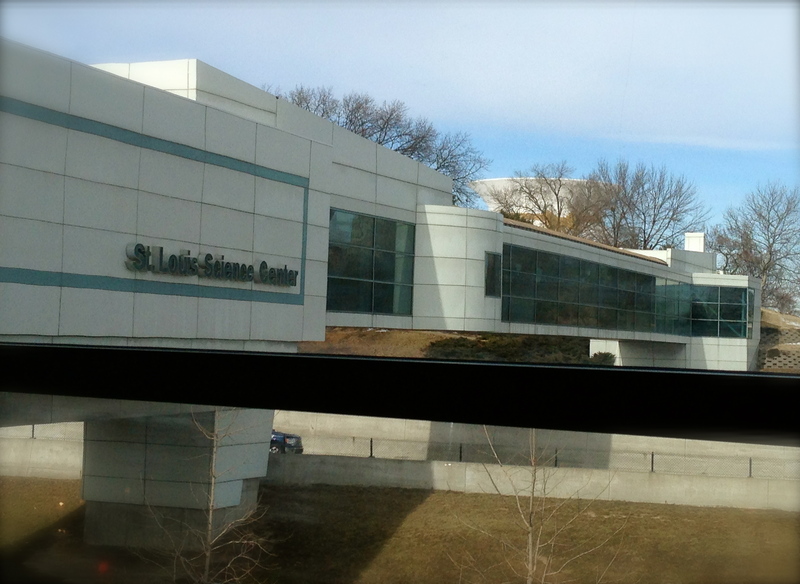 We could have gone to the art museum or the history museum, but instead we chose the science center. I actually didn’t even consider the art museum. 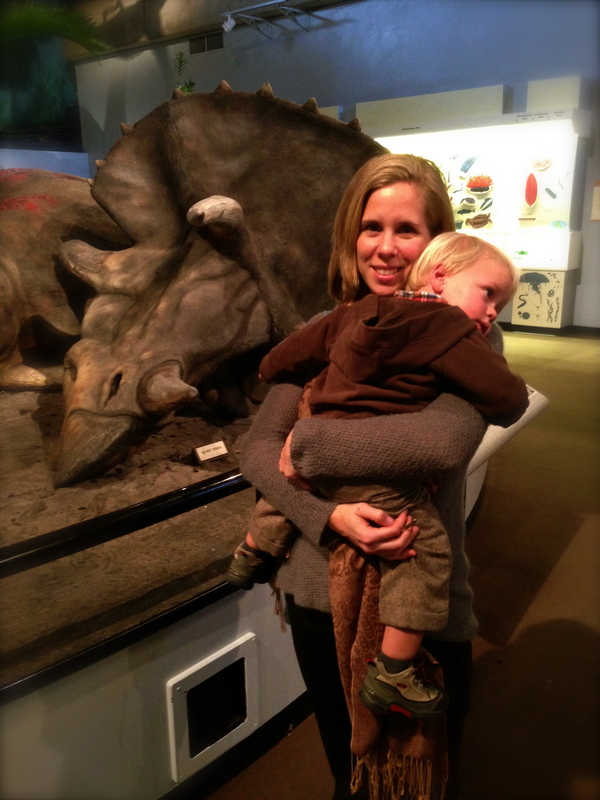 We probably would have gone to the zoo if it was warmer. So maybe it was more a factor of B’s age and the need to be loud and run. In either case, my goal is to be more aware of B’s interests. Right now, it’s all about transportation! 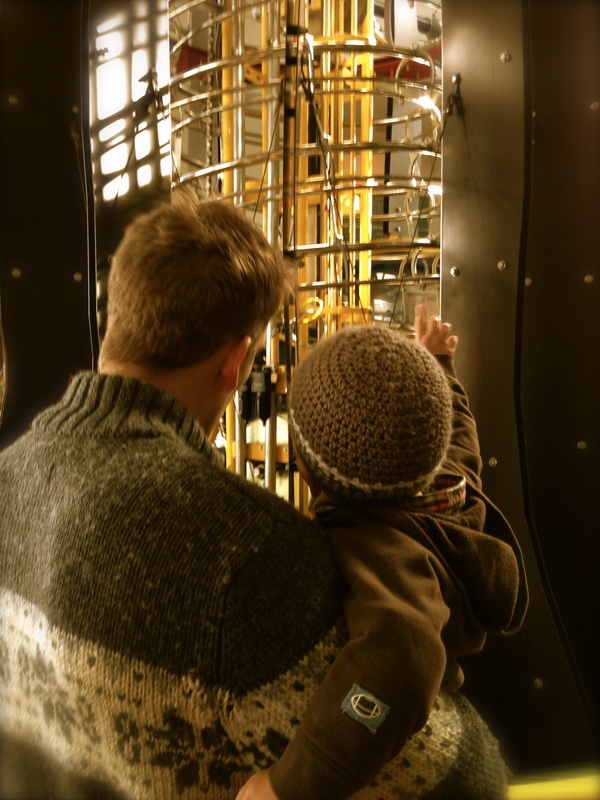 I like that our Montessori school allows for student/child independence and freedom to choose their own activities. My goal is to incorporate those ideas into our home as well. 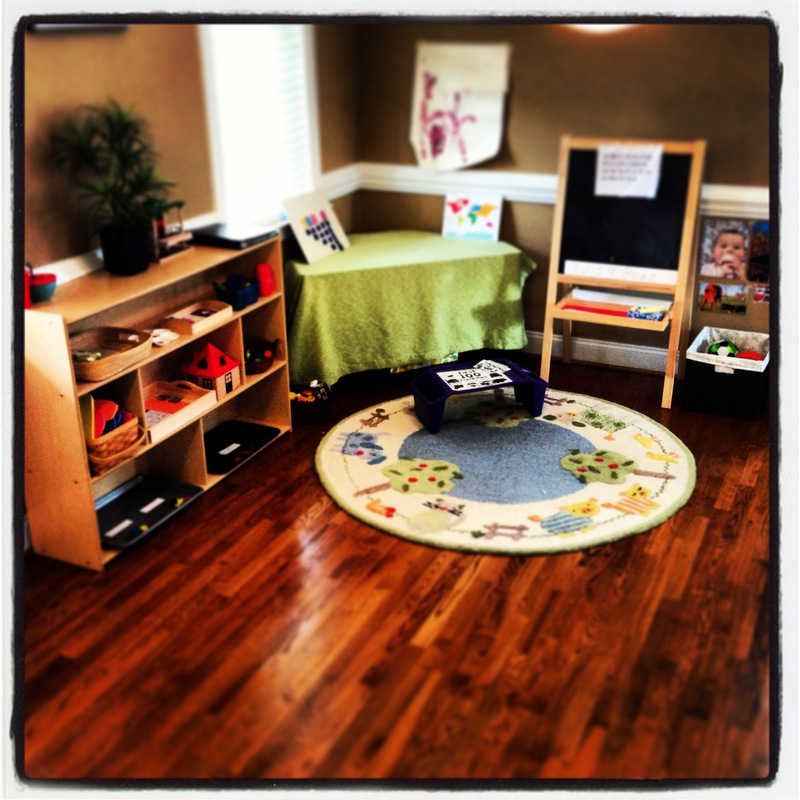 You can check out my at home Montessori activities in my other posts. 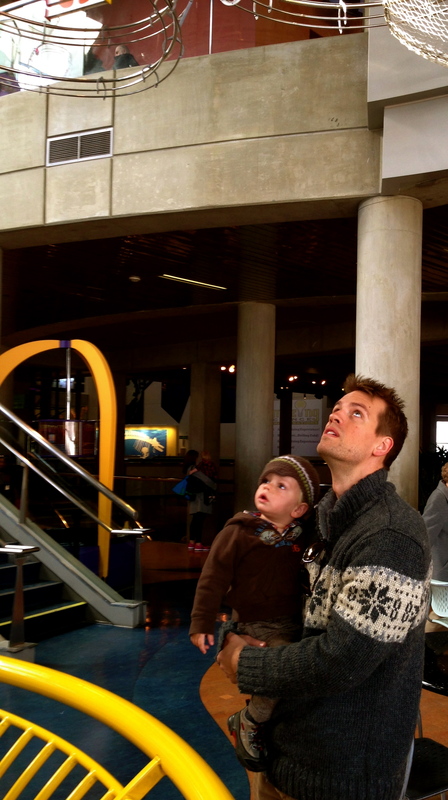 Does your family lean more towards the arts or science? How about sports? 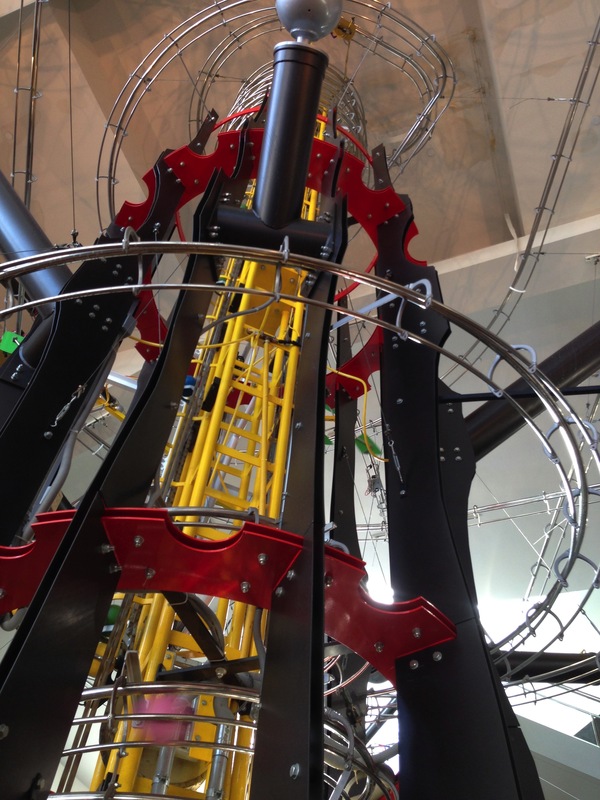 Categories: Get Active, Toddler | Tags: activities, home, Montessori, science, Science Center, St Louis, Toddler, trip | Permalink. 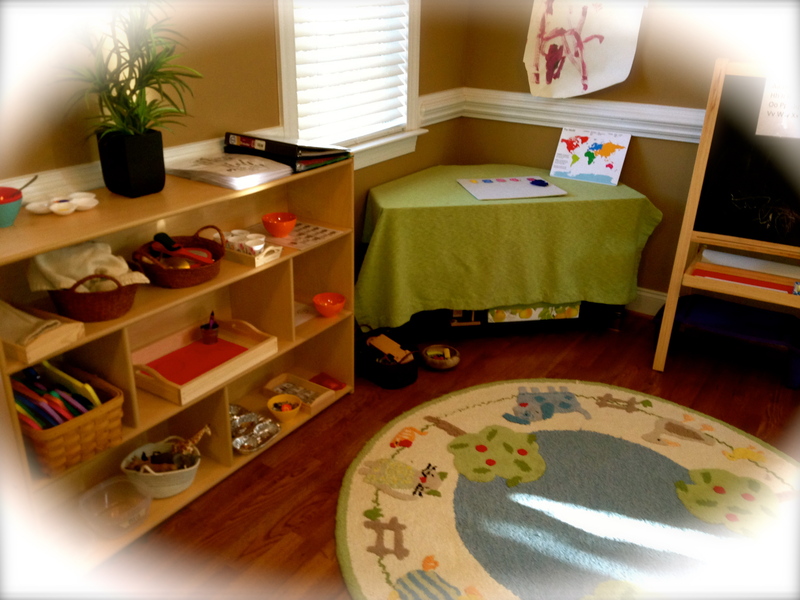 Here are some Montessori-inspired toddler activities that we are enjoying this week. The activities including a focus on math, sorting (early math), art mixed with language, music, practical life and more specific language activities. We are working on letter recognition and phonics. And we are working on number recognition 1-5 and the basic concept of numbers. 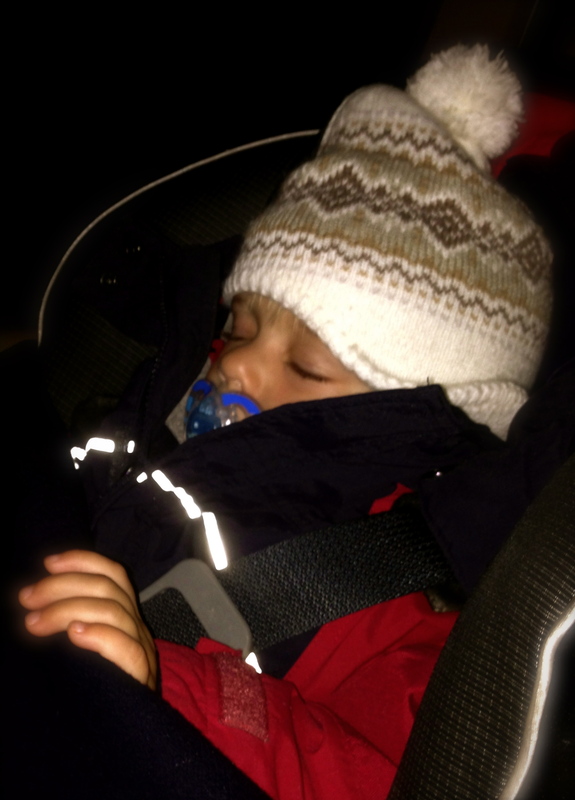 Sometimes B (22 months) will seem to understand numbers and sometimes he won’t. If he isn’t “into it” on any given day, I just move on. 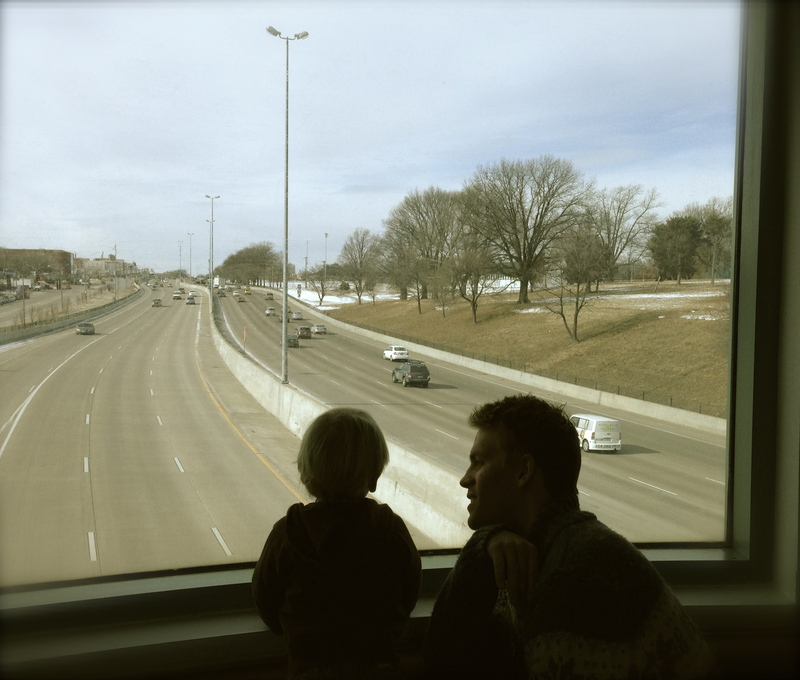 B loves transportation and construction vehicles, so I integrated that into our art and language activities. 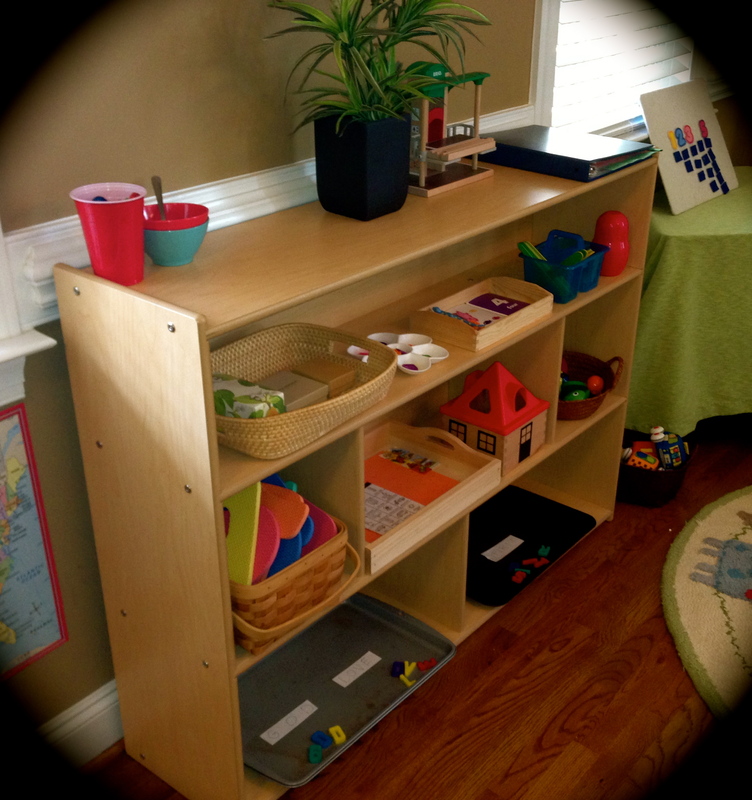 Here is a snapshot of our playroom and shelf this week. Below are a few of the activities. Here is a number activity. 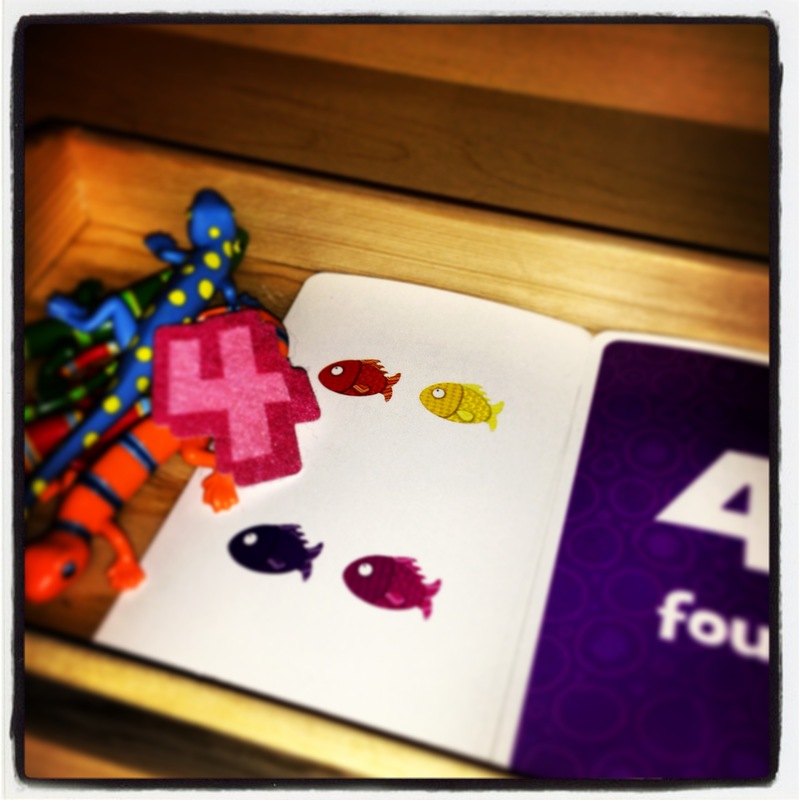 We enjoy placing the numbers 1-5 on our felt board and in the bathtub with foam numbers. Here I chose to highlight the number “4”. This tray has several different ways of showing the number “4”. B loves the counting lizards from Melissa & Doug. Here is a basic sorting activity. I am always so pleased with myself when I find a new way to display a sorting activity. I found this little art bucket in Target. It’s light and easy for B to carry. 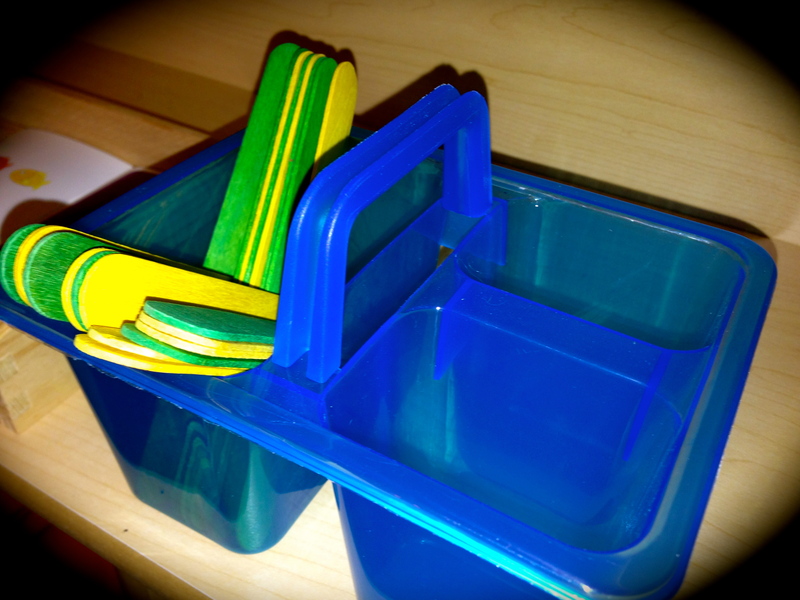 Here he will place the blue popsicle sticks on one side and the yellow sticks on the other. He loves it! Here is an art activity. I added a small printout of transportation pictures. I actually snagged this from Chik-fil-a! It’s an eye-spy road game that came in his kids’ meal. B enjoyed coloring the pictures as we talked about them and then we put down transportation stickers. Here is a language activity of sorts. It’s more about vocabulary than learning to read. 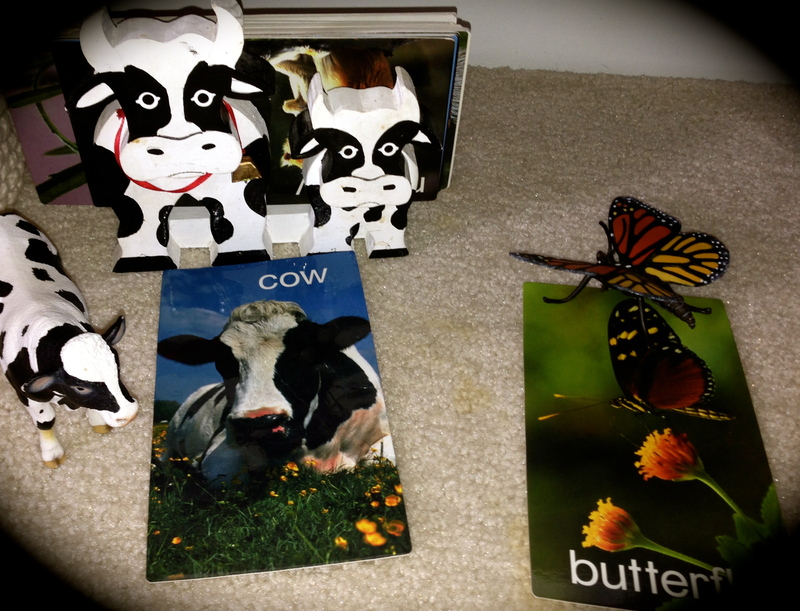 They are sort of conversation starters and from there we talk about other things relating to the cow and butterfly, like where we saw a cow or butterfly and what they eat and the sounds they make. This last activity is simply a music basket. 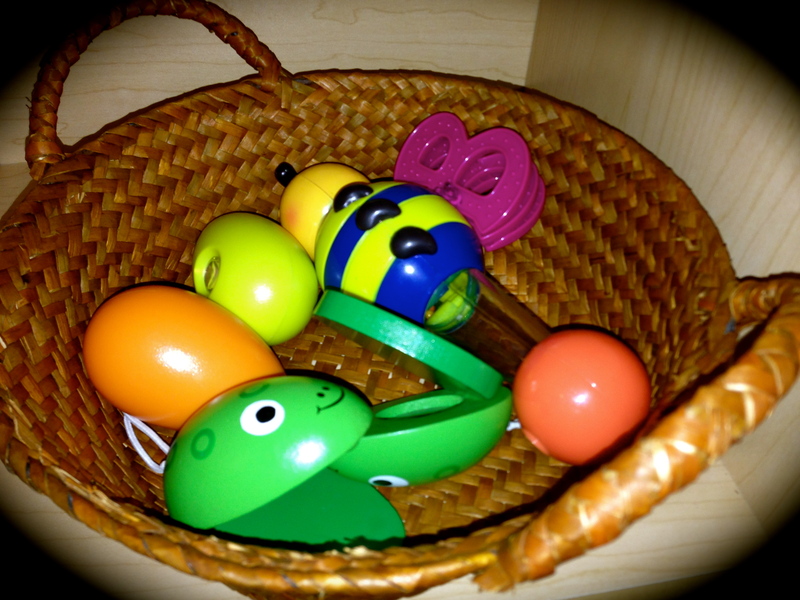 I usually have a basket of musical instruments out for B to play with. I rotate the instruments almost every week. I swear I find my husband playing with them more than B, so I guess it’s for the whole family. 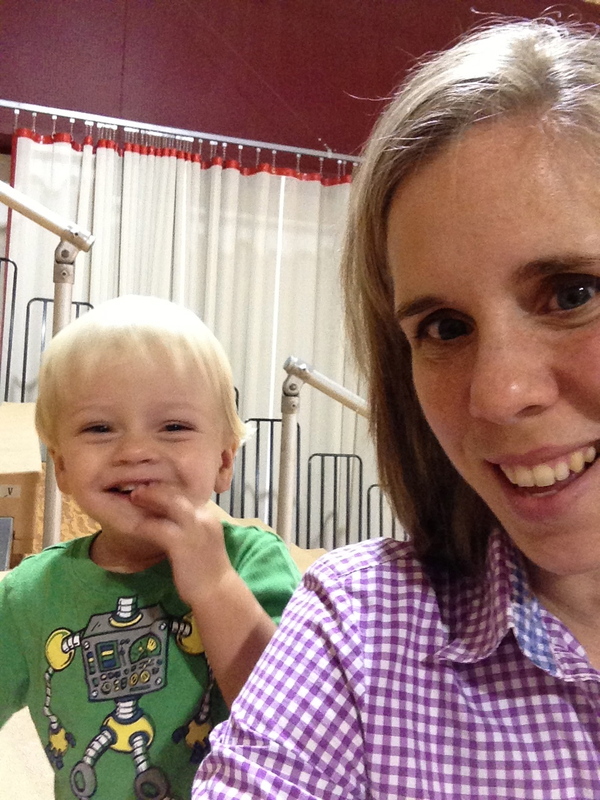 We go to a toddler music class once a week too, which is fun. B is one of the first toddlers to jump up and put things away. Otherwise, he’s shy and quiet (like mom). 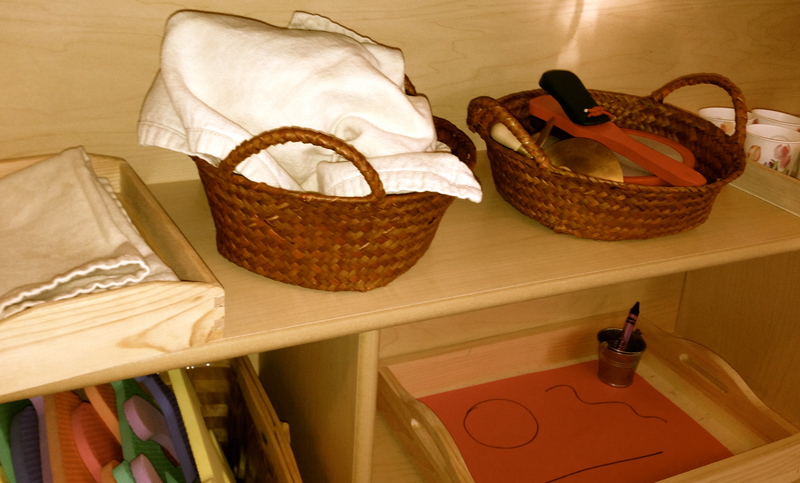 The teacher noted the Montessori approach they use to set up and clean up! She noted last week that the class had “normalized” meaning that they had mastered the concept of taking instruments out of the basket and returning them (without a fuss) at the end of a song. Montessori is everywhere! Categories: Toddler | Tags: activities, art, crafts, DIY, letters, Montessori, Music, numbers, Toddler | Permalink. Last time I posted about healthy breakfast meals. Here is a healthy (relatively) dinner for the family. I say “relatively” healthy because everyone have different standards. I like pierogis because my grandmother used to make them. They are basically potato-filled pasta that you can buy frozen. My toddler LOVES them! Very easy to make too. I first boiled the pierogis in water and then added them to a frying pan with sautéed onion, garlic, and mushrooms. I then added kale and heated it until the kale become soft. On the side, we had steamed broccoli (nothing added). Now here is the trick, at least this works with my toddler, I serve the veggies (in the case broccoli and kale) first. But I don’t push for him to eat the veggies, I just give him some time and then add the other food. I sit down with him and eat my plate of food just like I want him to eat. Then (and this seems to never fail) I read some books that he loves. I will read a few pages and then eat some food. Sometimes I prop the book up or just let him know we are taking a break to eat. You can sneak some new foods on the plate while they are engrossed in a story. I don’t force food but I will introduce it many times in many different ways. Less stress! What meal/dinner habits work for your toddler? Do you read during meals or something else? 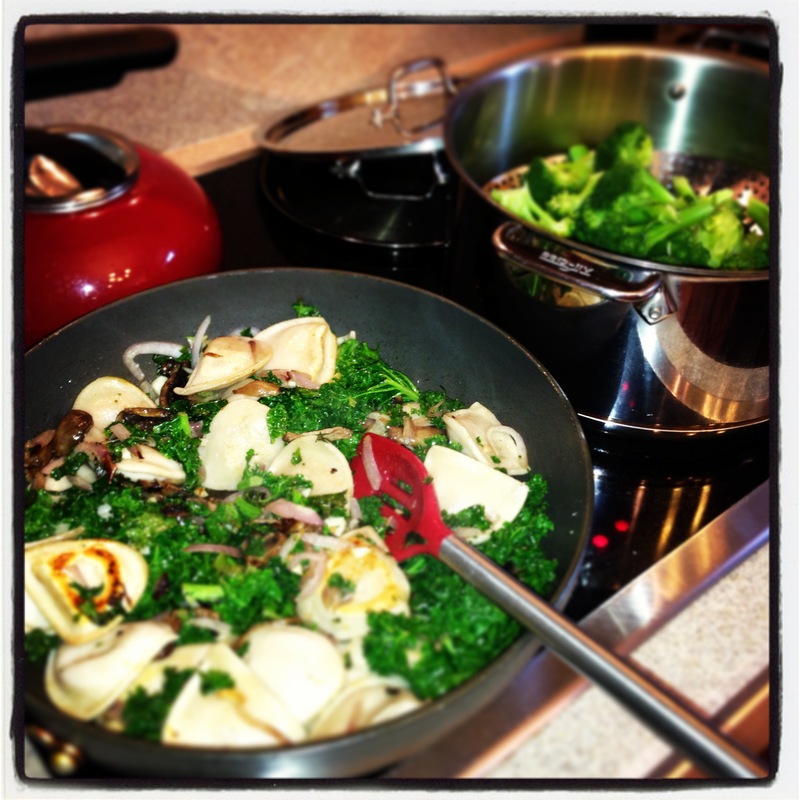 Categories: Recipes | Tags: dinner, Kale, meal, mushrooms, pierogis, recipes | Permalink. What is your typically breakfast? For me, breakfast is the most challenging meal of the today. My toddler (21 months) has inspired me to rethink breakfast. B does not like to eat first thing in the morning and he can often eat slowly. This means it’s better if we get up early and don’t rush breakfast – NOT EASY! I also want to make sure he gets protein in the morning to last him until lunchtime at school. My little guy goes to a Montessori school three days a week. I have more flexibility when he’s home with me because I can give him snacks and we don’t need to get to school on time. I say all that to show, as most parents know, that breakfast is the most challenging and important meal of the day. My goal for the New Year is to make more hot, healthy breakfast meals! To me this means the breakfast must contain: 1) protein 2) a green veggie 3) whole grains and 4) fruit. This does not happen every day but I’m getting better! Here is B’s favorite breakfast so far that meets all my requirements and is pretty quick to prepare. Oh yeah, it’s good for me too! and I always serve water with meals too. We don’t usually serve B juice but I will give him smoothies sometimes. I use about 1:4 ratio of smoothie with water. It’s really all about getting him more greens. Since B was born and even during pregnancy, I have determined that diets don’t work. It’s much for effective for me to focus on what I can and want to eat instead of what I can’t eat. I try to eat at least one green veggie a day (kale, spinach, brussels sprouts, parsley, etc.) and two veggie at dinner. I also try to drink as much water as I can. Sticking to just a few goals makes things much easy. And these goals fit perfectly with my hot, healthy breakfast goal! Do you have food goals for 2014? What is your toddler’s favorite, healthy breakfast? How do you manage the stress of the morning rush to school? Categories: Recipes, Toddler | Tags: bread, breakfast, eggs, food, Healthy, Kale, meals, recipe, Toddler, veggies | Permalink. 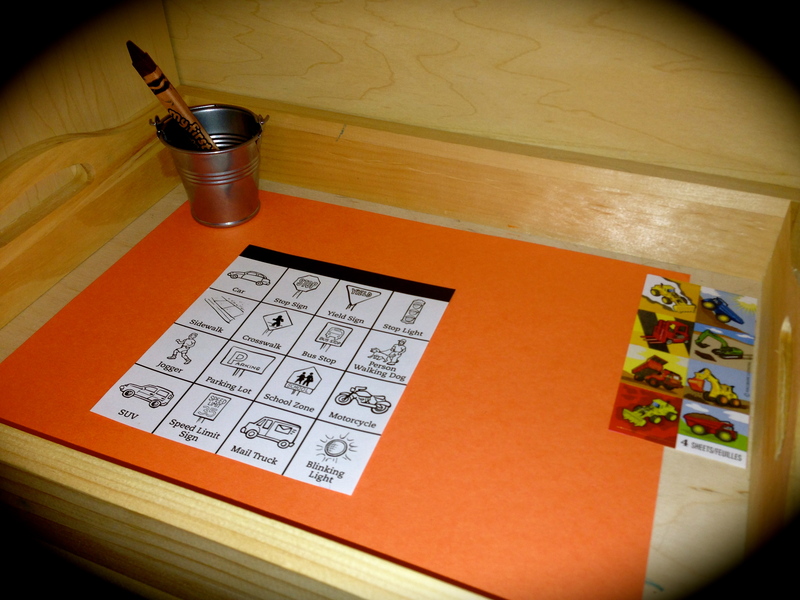 Toddler Activities: Numbers, Vowels, Big and Small! B loves the organization of a Montessori shelf. He knows to get one thing out at a time. It’s fun to see what activities he picks first when I put out new trays. Here are two activities with numbers. 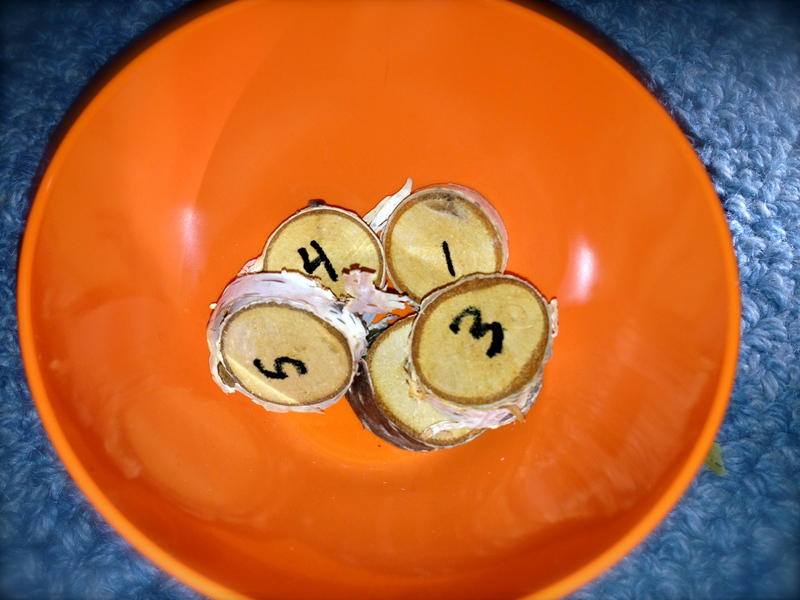 I found wooden pieces at the craft store and wrote numbers on them. He plays with them or we count things (stickers, cars, etc) and put the number next to the items. 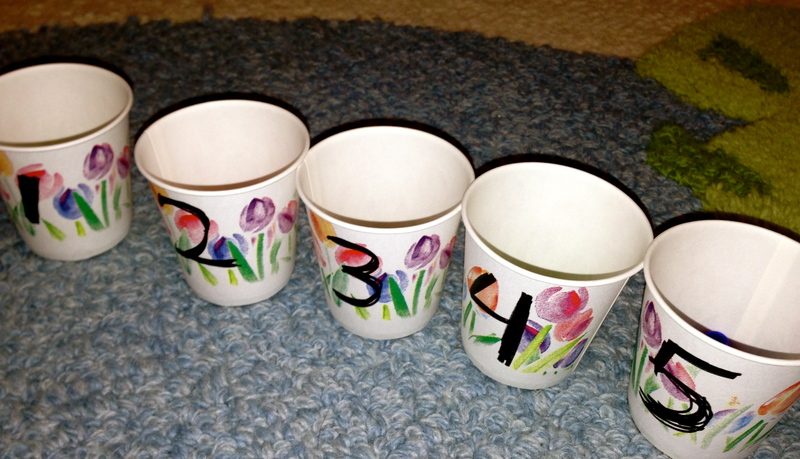 I also made some number cups. 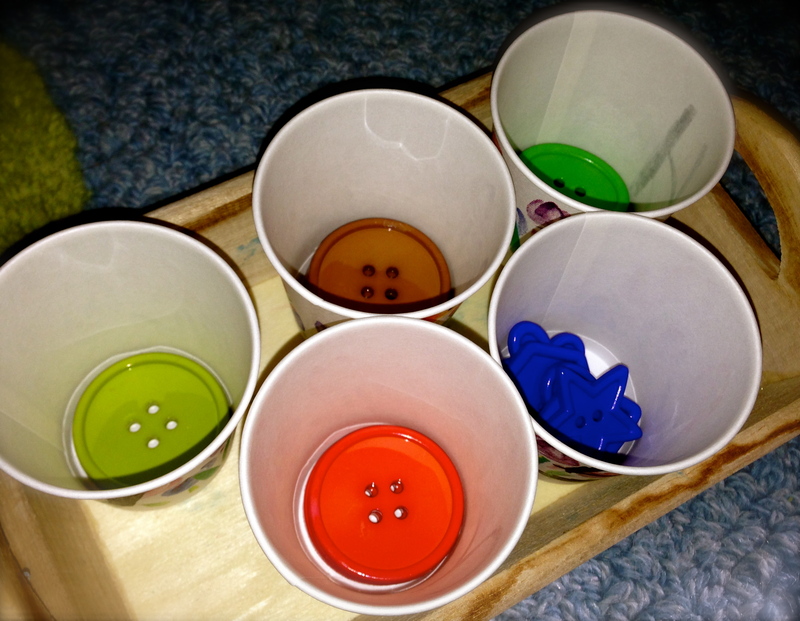 B can sort and count the buttons inside each cup. We do this together and he needs lots of help but it’s VERY fun. He loves the feel and colors of the buttons. B is learning his vowels. He can make the vowels sounds. He REALLY enjoyed putting the vowel wood chips on the mat. Next is a practice life activity – folding napkins. 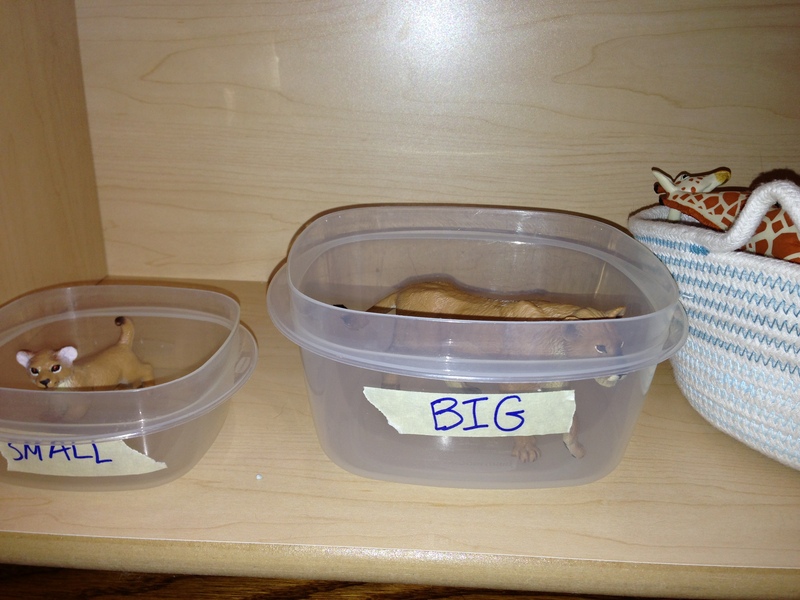 Next is an activity were we sort big and small animals! And finally here is a video of the shelf work on YouTube! ENJOY! And please share your favorite activities! Categories: Toddler | Tags: activities, DIY, Montessori, numbers, practical life, sizes, sorting, Toddler, vowels | Permalink.